Back on the Dawson Highway, we stopped at Moura for Peter to get a coffee. It is presumed that Moura may have got its name from a town in Portugal, where the first selector to the area, Charles Marshall, served during the Peninsula Wars. Maybe the land here reminded him of Portugal. About 3 kms east of Moura is 150E Meridian Marker. There are two holey rocks that are lined up on the invisible line on which Australian Eastern Standard time is based. This area is a major coal mining area and we drove for many kilometres along side landscape as below. The open cut mine is believed to have the worlds largest working drag line. There is a viewing platform, but we failed to find the road leading to it, so it goes on our next time list. The land is much greener, and the road is much better. We can also see a lot more water holes along the sides of the road. The next town we can to was Banana, and Jonnie was prepared for our stop there. The town is actually named after a bull! Banana was the name of a bull that was used as a decoy to trick wild cattle into yards. Banana was established in the 1860's and is a lovely small town with petrol at a reasonable price. We stopped for a banana, then headed off. The town is at the junction of the Dawson and Leichardt Highways - we will follow the Leichardt Highway on another trip. This time we are continuing to Biloela, then heading south on the 'Country Way' (Burnett Highway). We were not sure where to spend the next night. I liked the idea of staying at the Biloela Heritage Park Complex, but Peter wanted to keep going. 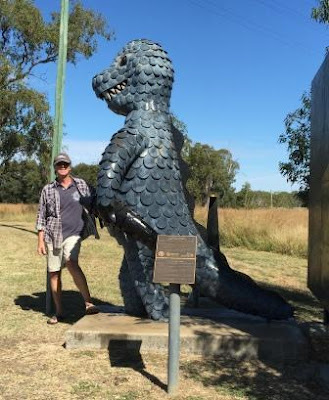 Biloela is quite large, and we filled up there, although we had to try four different stations to find a diesel pump that the car and van could fit in. We headed for the RV $5 a night camp in the centre of Monto. It was already fairly crowded, so we decided to keep going to the next 'free' camp, only 12klms down the road. Gee we are glad we did. 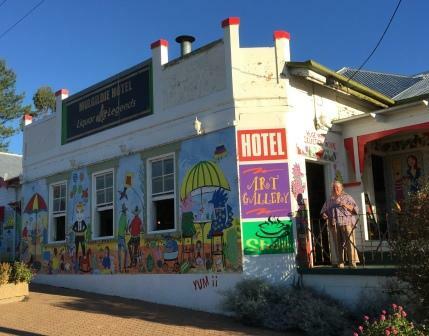 We pulled up at the side of the Mulgildie Hotel, which has free camping and quirky paintings on the outside walls of the pub. It also provides lovely decorated rooms for travellers to stay. After setting up the van we went for a walk around to the front of the pub. We decided to have happy hour at the bar, while chatting to a few locals about the area. 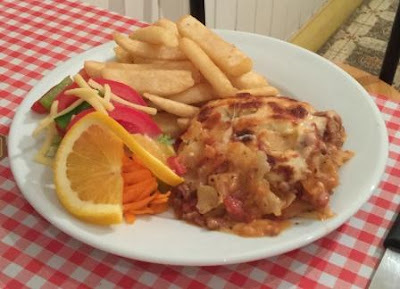 We also had dinner at the pub - such good food, and affordable prices. 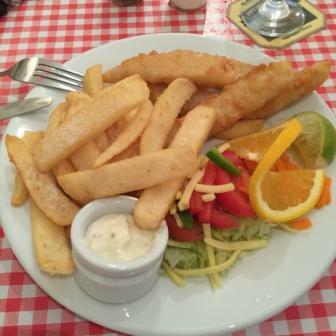 Jonnie and Peter had house specials @$10 each, and I had fish and chips @$15. Peter said it was the best curried prawns he has had for a long time. The next morning we packed and while Jonnie was getting ready, i.e. waking up, we went for a walk down the street. 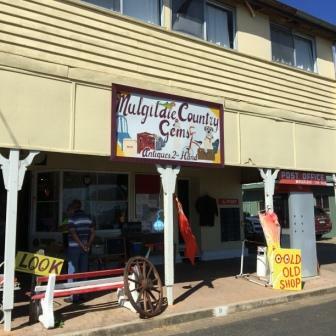 There is a Friendly Grocer who offers free tea or coffee, and an old wares shop called Mulgildie Country Gems, and what a gem. I loved looking at all the bits and pieces, and many reminded me of my childhood. 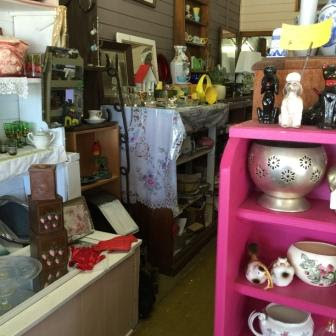 The lady who owns the shop was lovely. 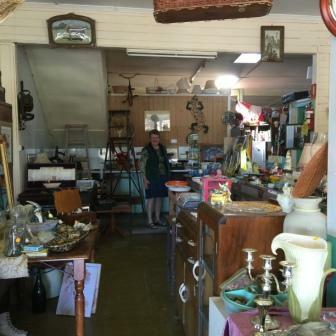 She even had a number of sewing machines, not in such good condition, but a collector would love them. 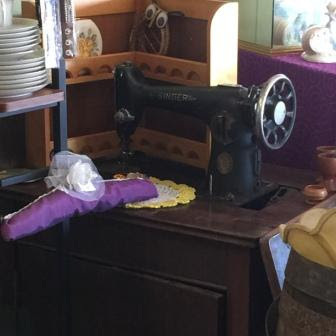 I was eyeing off a Jones treadle in the window - about $200 - but after my last purchase I should wait until I've restored that before I buy another machine for restoring. Across the road was a statue and information about the Mulgildie Bunyip. 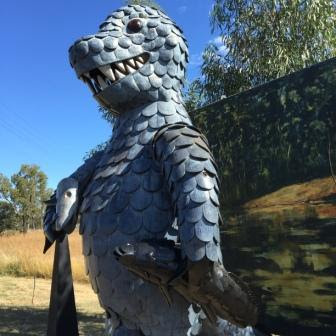 Aboriginal legend tells the story of Bunyips (monsters) inhabiting waterholes and making strange noises. There were reports of cattle disappearing and the area is known as Devil Country. 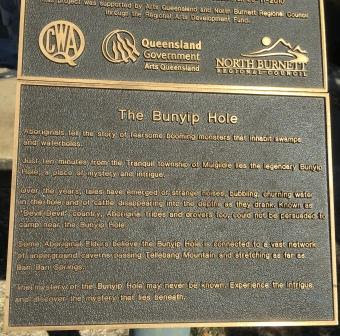 We didn't go to the Bunyip Hole as it was a little way from the town and not van friendly.